From the beginning of the match it was easy to see that Los Blancos wanted the two fullbacks to push high up the field while the 3 central midfielders spread out in front of the two central defenders. The front 3 of Real Madrid became narrow in order to combine with each other as well as offer a threat for longer balls (though they were quite disconnected from the rest of the team at times). This resulted in the Madrid forwards occasionally receiving the ball in the halfspaces and dribbling forward due to Valencia’s inconsistent shape. 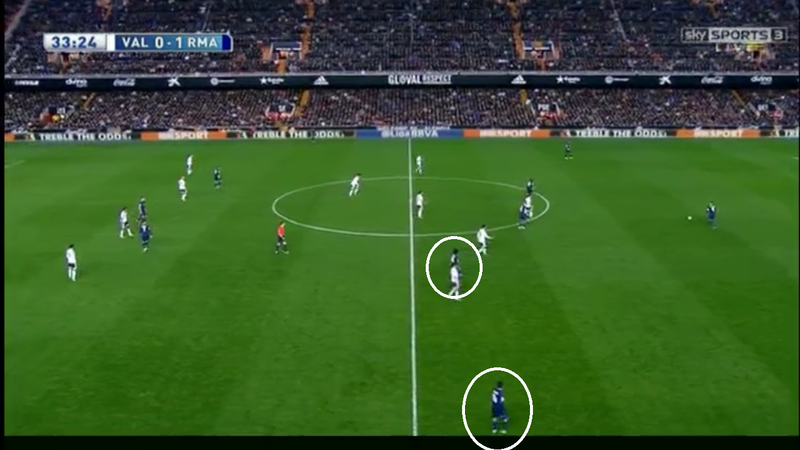 At times Kovacic would move even further wide in order to allow Marcelo into the middle. Kovacic even performed overlaps with Ronaldo and assisted him in breaking through the wing there. Marcelo was able to find space inside the halfspaces at dribble diagonally at goal on a few occasions which resulted in dangerous penetrations into the Valencia penalty box, but nothing came of it in the end – it was definitely a nice variation to the structure of the team though. Kovacic wasn’t followed that wide by his central midfielder while Marcelo moving inside attracted the attention of his opposing winger, leaving potential long diagonals to Kovacic open to gain space up the field. Valencia’s wingers looked to focus mainly on marking Madrid’s fullbacks. Similarly in the middle Gomes looked to man-mark Modric, but in a loose fashion. 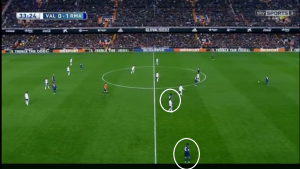 He didnt follow Modric very tightly, but frequently looked to put Modric in his cover shadow as he assisted Alacer in pressing the two central defenders. If he didn’t have the opportunity to press the central defenders he would move closer to Modric – but wouldn’t follow him if he moved very wide (which was rare). 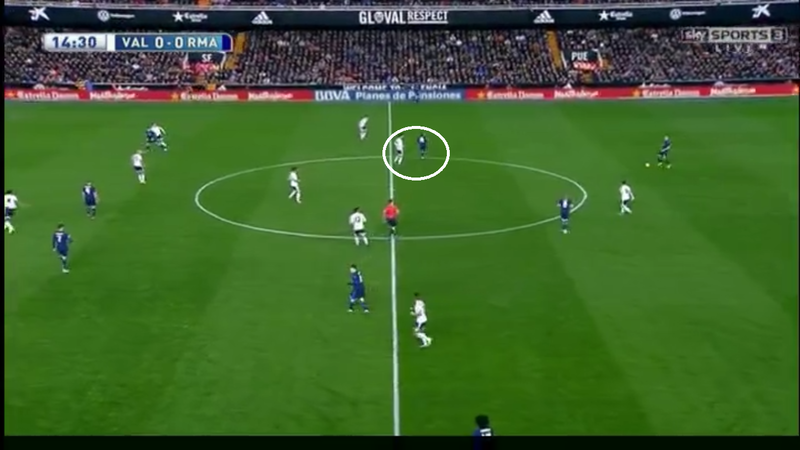 Kovacic and Kroos weren’t directly marked though and Valencia’s central midfielders looked mainly to protect their zones and then move out to press those 2 rather than to follow their movements. Due to Valencia’s wingers focusing on tracking the Madrid fullbacks, they were at times pushed deep enough to join their own back lines (sometimes a 6-3-1 and sometimes a 5-4-1), which left the central midfielders isolated in the middle of the field. Modric, Kroos, and Kovacic were able to play short diagonals from the center of the field into the open halfspaces where Benezema, Ronaldo, or Bale would frequently drop to receive the ball. From there one of the 3 forwards would dribble forward and push Valencia’s block deeper while looking to combine, shoot, or re-circulate the ball. Had Valencia’s central midfielders focused more on protecting the center and halfspaces only while letting the back 6 rotate and pressure up the wings – this system might’ve been more stable when it appeared for brief moments. A problem with Valencia’s pressing scheme (besides their lack of protection of the halfspaces) was their lack of access to Kroos in the center of the field. 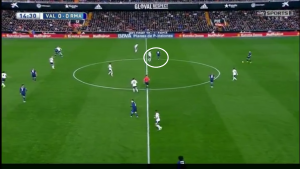 As Alacer would pressure one of the central defenders and the ball moved to either Modric or Kovacic on the sides – one of the Valencia central midfielders would naturally leave their line to go press the ball. 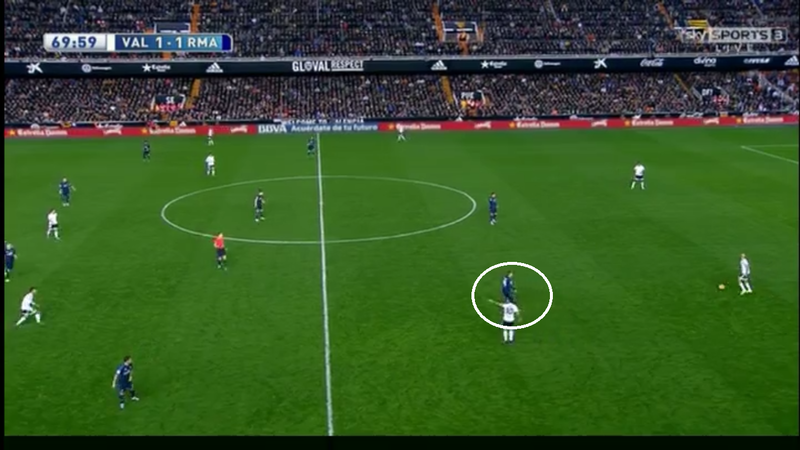 The space in the middle of the central defenders and Madrid’s 8s was where Kroos played as a defensive midfielder. Parejo’s distance to Kroos (and Valencia’s lack of presence in this space due to Alacer only focusing on the central defenders) allowed Kroos to receive the ball without pressure very often. He simply turned his field of vision forward and was able to use his excellent long-range passing ability to play penetrating balls or to re-locate the game and move the team up the field. Though due to Real’s lack of proper connection throughout the shape this wasn’t as dangerous. When Madrid was able to get through the Valencia midfield and in front of their defensive line, their 3 narrow forwards looked to combine. Benzema was the most fit for this type of approach in high pressure situations as both Ronaldo and Bale require more space to be dangerous with their dribbling (as they mainly use their speed to attack big spaces rather than dribbling between many opponents). In this scene a goal resulted from Benzema receiving the ball and then evading pressure from multiple Valencia defenders with his dribbling before he played a short pass into Bale who back-heeled it to Ronaldo in the defensive line. From here Ronaldo simply flicked the ball into the open space which would result from his positioning gathering pressure from Valencia. Benzema ran onto the ball (3rd-man run as most people call it) and through the space created from the lay-off and put the ball in the corner of the net – and excellent combination between Madrid’s 3 talented forwards. In possession Valencia’s fullbacks both pushed up while the wingers remained wide. This resulted in Alacer being quite isolated in the center of the field (as you can see in the graphic). Andre Gomes (who played very well) was the central midfielder who most frequently joined Alacer up front in the center of the field. Though Valencia didnt have much of a presence in the center of the pitch to play with, their wide wingers and high fullbacks allowed them to combine through the wings with more regularity – this was their main approach throughout the match. Real Madrid defended in a structure we were used to seeing under Ancelotti where the left central midfielder (Kovacic) would move out of the center and take of the left wing while Ronaldo remained in his favored position in the left halfspace and Benezema stayed in the center as a striker -though they did frequently rotate positions. Bale would drop into the right wing on the opposite flank while Modric and Kroos shifted across the center of the field to form this asymmetrical 4-4-2 shape. 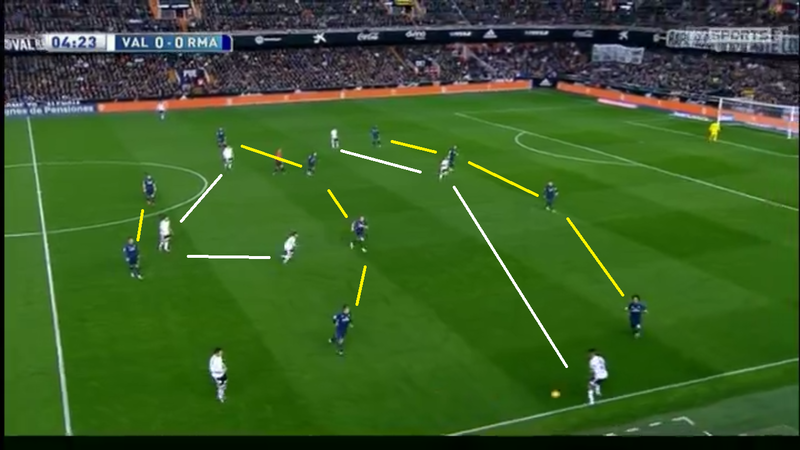 Though neither of the front 2 backwards-pressed very often and the collective shifted towards the ball quite slowly so when Valencia was able to gain control of the ball and push Madrid back into their half, they normally had a “safe zone” in front of the Real Madrid midfield. 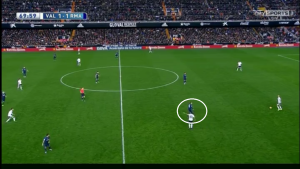 If the ball was forced away from Valencia’s right due to Real Madrid’s defense overloading that side of the pitch, Bale or Modric would step out of the midfield and attempt to press the right halfspace/wing which was left open due to the asymmetry next to Benzema. This was a nice defensive rotation as a collective to maintain pressure on the ball and a relatively compact structure. As you can see in the graphic, Madrid is controlling all the important zones (halfspaces and center) while being close enough to the wings to pressure them if the ball moved there. This was a common rotation while Ancelotti was the manager of Los Blancos as well. Problems arose though when Ronaldo would switch wings with Bale. As you can see in the graphic, Madrid’s midfield 3 lacked any support from the forwards and the collective wasn’t shifting quickly enough towards the ball. Valencia was able attack the poor pressing on Ronaldo’s flank with quick combinations to penetrate the halfspace and move into the box, which resulted in a few dangerous chances. Gomes earned a penalty when he used his huge running power in transition to break down Valencia’s left flank and attack Pepe in the box – which resulted in the 1-1. Valencia had a difficult time throughout the game gaining control of the ball for long periods of time. This is in part due to their wingers playing very deep while in defense and Alacer being left on his own against the Madrid defensive line. It was Gomes (a central midfielder) who eventually provided the energy needed to break through the left wing and cause a goal in transition – which makes sense as his positioning was the highest of the entire Valencia midfield. Real Madrid’s (normally poor) counterpressing attempts benefited from this as Valencia had no outlets in transition. The Real Madrid midfielders could aggressively counterpress immediately after losing the ball as there was no threat of a midfielder behind them receiving the ball and turning while the defenders could simply cover Alacer and intercept the passes into him. Valencia were able to stabilize their possession of the ball whenever Alacer came extremely deep in transition to help keep possession or if they managed to combine out of the pressure in transition. Funnily enough, Valencia’s approach to creating chances was their short combinations through the wings – but their best results came from long runs in transition and their long diagonals toward the far post with runners attacking (reminiscent of Gary Neville’s old coach – Alex Ferguson). In this situation Valencia moved towards the center of the field where there wasn’t as much pressure as I mentioned earlier. Coming out of a wing combination to avoid pressure and moving towards the center of the field with this sort of body position and lack of pressure allowed them to play accurate passes towards the most unprotected part of Real Madrid’s defense – this is also how their immediate equalizer in the last 10 minutes of the game occurred. As expected after a red card, one team became more defensive in order to try and protect the result which they already had (1 point out of this scenario isn’t bad, even though they had a chance at 3 after their go ahead goal) while the other became positionally and rhythmically more offensive looking to get more points out of the situation. In the graphic on the left you can see that Valencia has 3(!) players in the center in front of Real Madrid’s defensive line while there were also 2 players as wide passing options filling the vacant wings. Because Real Madrid played in a 4-4-1 formation they lacked enough presence in their front line pressure to stop Valencia coming up the center of the field. 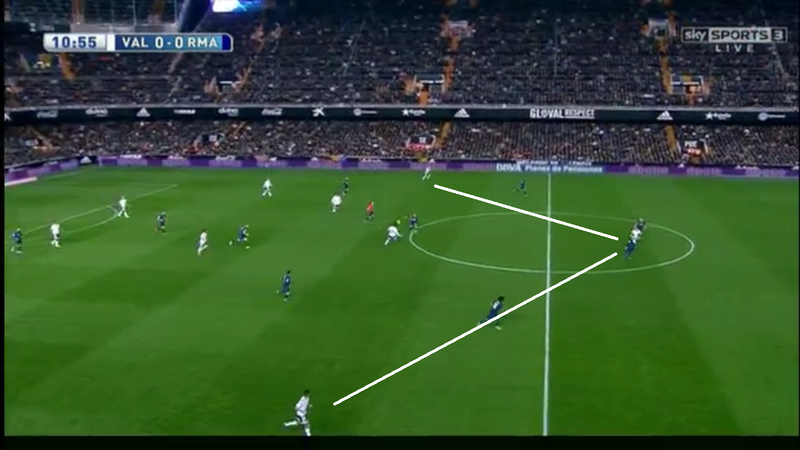 Here the player on the ball plays a short diagonal towards the player in the right halfspace with dangerous potential for a combination to break through the Real Madrid defense, but nothing came of it. The Valencia central defender on the ball could now simply play a vertical ball through the open Madrid midfield as there is no pressure on him and Valencia now has a high amount of players in front of the defensive line in the center and halfspaces. In this situation the player on the ball was able to dribble away from pressure on the wing back towards the center of the field. From that position his body is between the closest defender and the ball – and he has a great body position and field of vision to play an accurate diagonal ball through the defense which was headed across goal for Alacer (the attacker closer to the ball) to tap in from in front of the goalmouth. 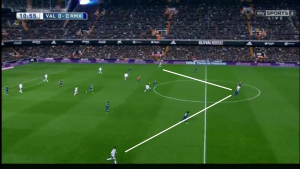 Valencia struggled early on in the game due to their defensive organization but was able to expose Madrid a few times in transition and with long diagonals toward the far post. Once the red card happened and after they went down 1 goal to a very good Bale header from a set piece, they were much more focused on getting numbers forward and looking to combine on the wings in order to cross the ball into a box with a high number of attackers. Gary Neville probably saw the benefit of a strategy similar to that of one in which he played in as a footballer for Manchester United. The red card had a huge effect on the game and it was the main cause for Real Madrid losing 2 points away to Valencia here in a league in which its extremely important not to drop points while competing for the title with the likes of FC Barcelona and Atletico Madrid. Both of these managers are under fire in the media, but their teams definitely put on a performance any fan could enjoy. Both Benitez’ Real Madrid and Neville’s Valencia definitely looked like they had some improving to do – particularly in the isolation of players within their offense. It will be interesting to see how the rest of the season plays out for both of these men.